Note: For the planet Saturn, please click here. In Roman mythology, Saturn (Latin: Saturnus) was a major Roman deity holding jurisdiction over agriculture and the harvest. 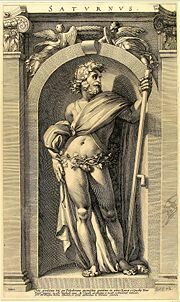 Like many of the Roman mythological figures, Saturn was appropriated from the Greek tradition, and his mythology is commonly mixed with that of Cronus, the god of the harvest and one-time supreme deity in the Greek pantheon. Much like Cronus, Saturn also fell from his position of divine supremacy. However, Saturn maintained his significance in the popular religion of the Romans due mainly to the Saturnalia festival, which was centered upon him, far exceeding the measure of esteem Cronus ever enjoyed among the Greeks. The origins of the theonym Saturn, and the nature of the earliest forms of the god are not altogether clear. While numerous authors both ancient and modern have suggested that the name derived from the verb sero/satum, "to sow," bearing an obvious connection to agriculture, others have disagreed. The name more likely derives from the Etruscan Satre, which referred to a god of the underworld who was responsible for funereal matters. This etymology is supported by the fact that it parallels the origin of other Latin names that end in -urnus, -arnus, and -erna and demonstrably derived from Etruscan roots (such as Volturnus and Mastarna, among others). If this is indeed the case, then Saturn may have originally been a underworld deity linked to funerary rites. This seems plausible, considering that Saturn has often been connected to the Roman institution of munera, gladiatorial exhibitions of Etruscan derivation which were originally held to celebrate the funerals of patricians. After the Romans invaded Greece in 146 B.C.E. and subsequently began to acknowledge the Greek myths as their own, Saturn became virtually indistinguishable from Cronus. Just like Cronus in Greek mythology, Saturn was the son of the supreme sky god (Caelus, equivalent to the Greek Uranus) and the earth mother (Tellus; Greek Gaia). Caelus's reign was marked by tyranny, and so Saturn overthrew him, thereby supplanting him as the supreme deity. However, it was foretold that one day a mighty son of Saturn would in turn overthrow him, and in order to prevent this from occurring, Saturn devoured all of his children by his wife Ops, a goddess of fertility and the earth (equivalent to the Greek Rhea), as soon as they were born. Among these children were Ceres (goddess of plants), Veritas (goddess of truth), Vesta (goddess of the hearth and home), Pluto (god of the underworld), Neptune (god of the waters), and Juno (eventual queen of the gods). For fear of losing a sixth child, Ops hid Jupiter and offered Saturn a large stone wrapped in swaddling clothes in his place. Saturn promptly swallowed the stone, and in the process of ridding it from his digestive system was forced to disgorge each of his children as well. Jupiter later returned to overthrow Saturn, becoming the new supreme ruler of the cosmos. Defeated, Saturn fled away from Jupiter to Latium, where he was taken in by the god Janus. Here Saturn introduced agriculture and ushered in a mythological period of great peace and contentment called the Golden Age, over which he ruled. During this time, all human beings were said to be equal, with no social distinctions made between classes. The notion that he ruled over the Golden Age after his usurpation as king of the gods is a uniquely Roman extrapolation upon the Greek myth. In congruence with the new agricultural techniques that Saturn taught the people of Latium, he was construed as a harvest deity, overseeing grain, agriculture and nature in general. Fittingly, his symbol was the sickle, which he carried in many depictions. His association with the Golden Age lead him to become linked with the progression of time as it related to humans. This gave him special jurisdiction over calendars and the seasons, as well as significant events over the course of a year, most notably the harvest. The remains of the Temple of Saturn in the Roman Forum. 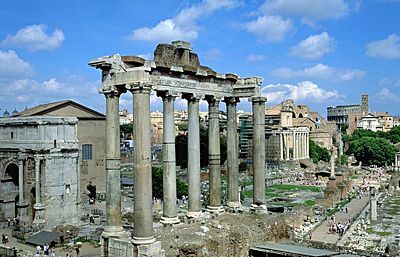 The most famous temple to Saturn, the Templum Saturni (or Aedes Saturnus), was located at the western end of the Forum Romanum, the heart of commerce for ancient Romans. The temple marks the beginning of the Clivus Capitolinus, the old road that leads up the hill of the Capitol. Still standing today, the temple of Saturn represents the oldest-surviving foundation in the Forum Romanum, having been established between 501 and 498 B.C.E. Some sources attribute it to the King Tarquinius Superbus, others to Lucius Furius, although the latter dedication could belong to a reconstruction that came after the Gauls set fire to the temple in the early fourth century B.C.E. The present ruins represent the third incarnation of the Temple of Saturn, replacing the second incarnation destroyed by another fire in 283 B.C.E. Gradual collapse has left nothing but the remains of the front portico standing. Regardless, the eight surviving columns and the partially intact pediment which displays the inscription Senatus Populusque Romanus incendio consumptum restituit ("The Senate and People of Rome restored what fire had consumed") represent one of the foremost iconic images of Rome's ancient architectural heritage. The temple's main cult object to Saturn stood in its interior and was constructed from wood. The statue was veiled and carried a scythe, and according to some sources, was filled with oil. Its legs were bound throughout the year with linen bents, which were released only for the duration of the Saturnalia festival. While dedicated to the god Saturn, the temple's primary use was as the seat of the Royal Treasury of the Roman Empire, storing the Empire's reserves of gold and silver; in this function it was also called the 'Aerarium'. 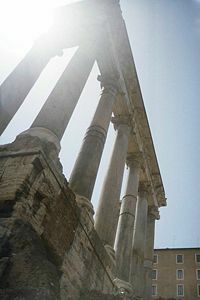 The Temple of Saturn as seen from the ground. Saturnalia, one of the most popular public festivals in ancient Rome, took place around the time of the winter solstice. It originally lasted for only a single day, December 17, but was later extended over a whole week. During this time the ropes that bound the statue of Saturn in the temple during the rest of the year were untied. The festival served not only to celebrate the dedication of the temple of Saturn, but also to commemorate the mythical Golden Age over which Saturn ruled. In order to recreate the harmonious spirit of this period of time, distinctions between master and slave were ignored for the duration of Saturnalia, much as they were during the festival of Kronia in which the Greeks honored Cronus. Thus, all Romans wore the pileus, the hat of the freeman, during this holiday, regardless of whether or not they were a citizen. In fact, during the great feast which represented the culmination of the festival, slaves were allowed to sit along with their masters, who would sometimes go so far as to actually wait upon their slaves themselves, marking a complete reversal of roles. Furthermore, rules of etiquette were ignored. For instance, the traditional white toga that Roman citizens wore around their body as a symbol of their social status was given up in favor of a more decadent colored cloth called a synthesis. Preexisting bans on gambling were lifted throughout Rome during Saturnalia, and scores of dice games took place in the streets. A "king" was crowned from among the commoners by way of a dice-roll; over the course of Saturnalia this ruler possessed the power to demand all sorts of silliness from his subjects. Saturnalia also involved the exchange of gifts, with both the poor and the rich giving and receiving presents. All in all, the holiday was marked by widespread merry-making and lechery. Saturn has had a lasting impact upon Western culture. Most notably, he is the namesake of Saturday (dies Saturni), which was originally referred to in Latin as Dies Saturni or the "Day of Saturn," and was in turn adapted and became the source of the English word. This stands as the only day of the week to retain its Roman name in English. In astronomy, the name of Saturn has been given to the sixth planet from the sun. In classical antiquity, the planet Saturn was considered the furthest planet of the seven heavenly objects that is visible to the naked eye, and was thereby corresponded to the seventh day of the week. Also, the phrase referring to a "Saturnalia of crime" takes root from the aforementioned festival dedicated to the god and the chaotic indulgence it entailed. Moreover, some have entertained the theory that Saturnalia may have influenced the popular Christian holiday Christmas, as both events occur in late December and involve the exchange of gifts. ↑ Pucci, "Roman Saturn: The Shady Side," 37. ↑ G. Herbig, "Satre-Saturnus" Philologus 74, 1917, 446 ff. ↑ "Saturn" Encyclopedia Mythica Retrieved February 19, 2008. ↑ The Real Story of Christmas. Retrieved February 19, 2008. Dennison, Walter. "The Roman Forum as Cicero Saw It." The Classical Journal, Vol. 3, No. 8 (Jun., 1908), 318-326. Frank, Tenney. "Roman Buildings of the Republic: An Attempt to Date Them from Their Materials" The Journal of Roman Studies, Vol. 15, 1925, 119-124. This page was last modified on 20 August 2015, at 19:24.